Guests may arrive at the venue starting 4PM. Only persons seven (7) years old and above are allowed to be part of the audience. Present your KTX ticket with barcode upon entry. By booking this ticket, you agree to the event guidelines as indicated in the event details. 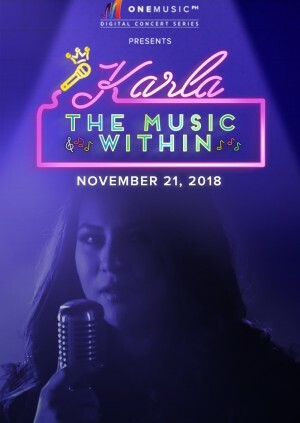 Enjoy a live digital concert featuring Karla Estrada! 2. Guest must either download and print your tickets or be able to show it on a smartphone to the event officer at the entrance. You may be required to show I.D. to confirm you are the ticket holder. 3. Only persons seven (7) years old and above are allowed to be part of the audience. Adults must accompany kids if any at a 1:1 ratio, and may be required to present proof of age of a child (such as birth certificate or school ID). Pregnant women and persons with heart conditions shall not be allowed to be part of the audience. 4. Smoking including vape and e-cigarette are prohibited inside the studios. 5. The following items are strictly prohibited and may not be brought into the Studios: (a) firearms and deadly weapons (such as metallic and sharp objects); (b) alcoholic drinks; and (c) video cameras. 6. The producers will not be liable for any loss of or damage to personal properties of, or any injury suffered by the guest during the concert. 7. Guest must remain in their respective seat sections, and may not loiter in other areas/premises. Guest shall not handle or use any equipment, or step or sit on any stage or platform areas, located within the concert area. 8. The producers has the right to refuse entry or remove from the concert premises any person who manifests unpleasant, undesirable or inappropriate behavior. 9. The producers will not be responsible for any tickets that are lost or stolen. 10. Unlawful resale of a ticket is grounds for seizure or cancellation of that ticket without refund or other compensation. 11. ABS-CBN reserves the right to cancel bookings that it reasonably suspects to have been made fraudulently.